My first open crossing was back in 1982, Plymouth out to the Edison Lighthouse and back, my boat then was a hand built Yellow Seahawk called the ‘banana’. It was just a few months after the lighthouse had been automated, a pity as the last keeper welcomed the occasional visit from the odd paddler or two and always offered a drink of something revitalizing. Never the less the sense of achievement has never left me. For several months I had in mind a trip from Belle Ile to the French mainland, I favoured St Nazaire as the destination, it would be good to finish at the mouth of the loire with a following tide. I invited Mike Smith to come and join me, just a few weeks earlier we had to cancel a crossing over to Lundy when the weather changed quite suddenly and we both needed a decent stretch and a good result. The European medium range forecast had been predicting high pressure off the west coast of France for some three weeks, long enough for Mike to make arrangements to get across. Long open crossings usually involve tedious shuttling of cars or cadging a lift off friends, but for this trip neither was necessary, our friends at St Nazaire had a kayaking trip to Belle Ile on their Calendar. 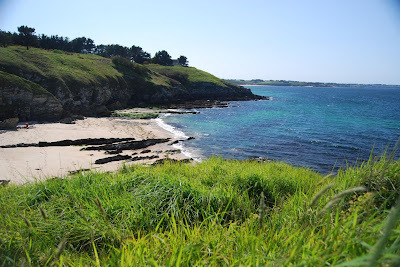 We arrived at Quiberon, and watched our friends leave for the northern end of the Isle to start their three day tour, shortly after we departed in brilliant sunshine due south for the Pointe du Kerdonis running with the tide. It all now depended on the wind, if conditions were right we would leave Saturday morning, we also had Sunday to fall back to, but Saturday was perfect. 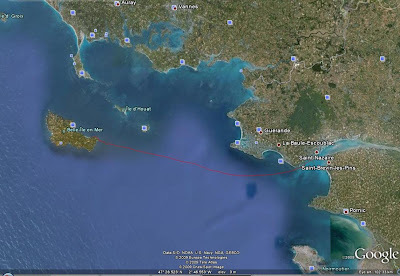 On 2nd May we left the Pointe de Kerdonis at the southern tip of Belle Ile for Saint Nazaire, 38 Nautical miles on the Atlantic coast of Brittany. The morning was very quiet and misty, but we soon were able to pick out the Lighthouse Le Grand Cardineax, off the Island of Hoedic, the sea was unexpectedly quiet, but the wind was rising. As we moved further along our route we managed to pick out Le Four, the lighthouse four miles west off Le Croisic. A good mark for us it indicated the end of our open passage and we knew that shortly we would have the mainland in view. A small amount of swell now gave us the advantage of the occasional surf towards our destination and a welcome distraction from the flat water of the morning. By the Bay of La Baule we had moved much closer to the shore and now had a number of Sailing craft moving around us. They are a real hazard, one passing 30 meters in front of us towing a ‘log’ through the water on a very fine wire, I stopped just in time, Mike calling out to me the hazard, in the brilliant sunshine I only saw the wire glint at the very last minute at neck height. This was an enjoyable trip, the currents were difficult with no real assistance until the last leg of the journey. Both of us used ‘Tahe Marine’ Reval Viking Sea kayaks, this is a true Sea kayak as opposed to the modern Ocean racing boats, capable of handling big seas, and carrying a good load, but at 5.8 meters is excellent for those who enjoy longer trips. 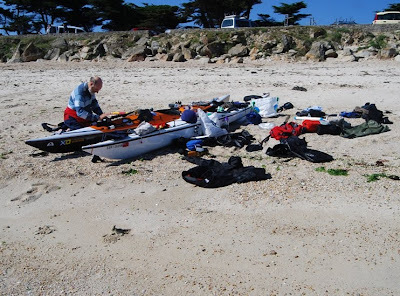 Hi Colin, Read your interesting report about the crossing from Quiberon to Belle Ile and beyond. Well done on your achievement. I am making this crossing on 12 Aug next and was wondering if there are any significant currents to deal with. Forecast is for F4 NE with wave height of 1 metre. Can you say where you launched from. We are attending the international sea kayaking week there but as usual the French are not too communicative on important details. I will be heading to La Baule after this but unlike you by car.